Review: A biopic about Steve Jobs who was the co-founder of Apple Inc. 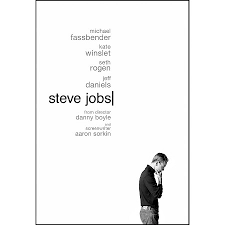 This is based on Walter Isaacson’s best-seller about Jobs. Michael Fassbender was incredible in this as he always is in his films. In the film he comes across as a very unlikable character and very selfish. As much as I love Kate Winslet I didn’t really think that her character suited her. I just got annoyed with her which has never happened before in any of her movies. Aaron Sorkin wrote the screenplay for this (he wrote the screenplay for The Social Network, 2010). Apparently David Fincher was originally down to direct this film which I can relate to as I think they are both similar stories. David Fincher directed The Social Network. The film Steve Jobs over in America never actually managed to find the right audience and was pulled out in about 2,000 cinemas. Christian Bale was cast as Steve Jobs but exited the project. Before Christian Bale was cast Leonardo DiCaprio was approached but dropped out in order to take the lead in The Revenant, 2015 . There was a similar film out about Steve Jobs staring Ashton Kutcher which was just called Jobs (2013). At the Golden Globe Awards in 2016 this won 2 awards. They were for Best Performance by an Actress in a Supporting Role in a Motion Picture (Kate Winslet) and also the other award was Best Screenplay – Motion Picture. At the Bafta Awards in 2016, Kate Winslet won for Best Supporting Actress.